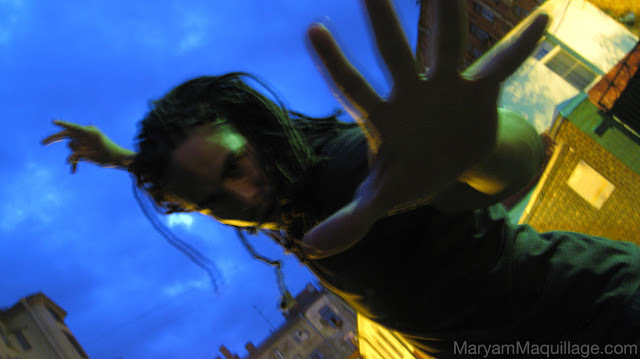 The photos below are from my personal collection and were taken during the White Nights in St. Petersburg, Russia. White nights is the name given in areas of high latitude to the weeks around the summer solstice in June during which sunsets are late, sunrises are early and darkness is never complete. In Saint Petersburg, the Sun does not set until after 10 pm, and the state of twilight lasts all night. 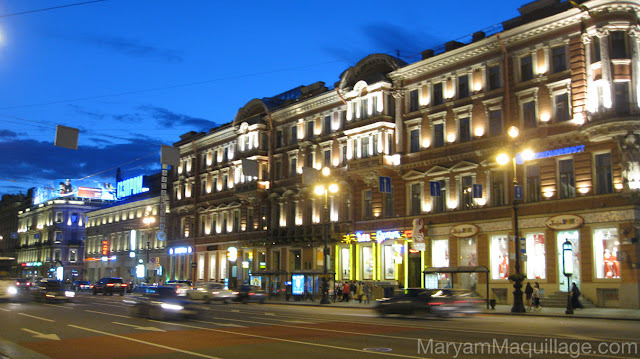 I was lucky to be born in St. Petersburg (then Leningrad) and though I'm quite used to the White Nights, most tourists are completely fascinated with it, as was my boyfriend Lee Lee when he visited. He is clearly psyched out in the photo above, which was taken around 2 am. During the White Nights, St. Petersburg is at its most beautiful state. Not only is everyone up and about, but they are also celebrating, which makes the city's atmosphere very joyous, festive and romantic. 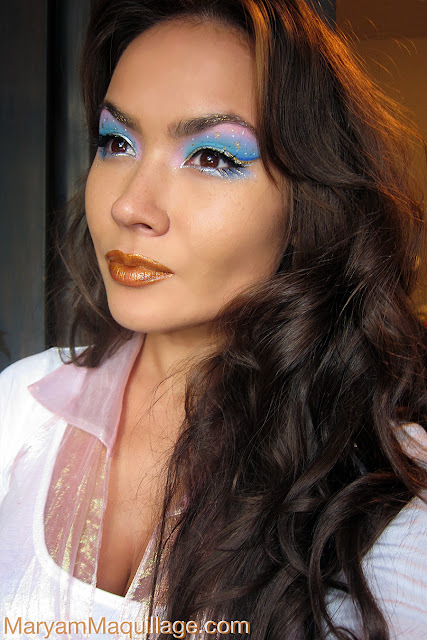 I wanted to capture the celebratory spirit of the White Nights in my makeup look, and this is what I came up with: twilight sky, shimmery lights and stars to indicate night time. Use a neutral or white pencil liner to outline your crease (or where you want the shadows to start) -- the so-called cut crease. Using a small flat shader brush, pat on a matte sky blue shadow (Parasol) directly to the outline and above. Using the same brush and a matte lavender shadow (Ribbonesque) blend the transition of the sky blue by patting on the color to begin the sunset gradient. Use the same technique with a matte pink shadow (Royal Flush) to complete the gradient. Add a shimmery sea foam green shadow (Atlanteal) to the center of the lid and a bit of the shimmery blue (Nautilus Prime) to the lower lash line. 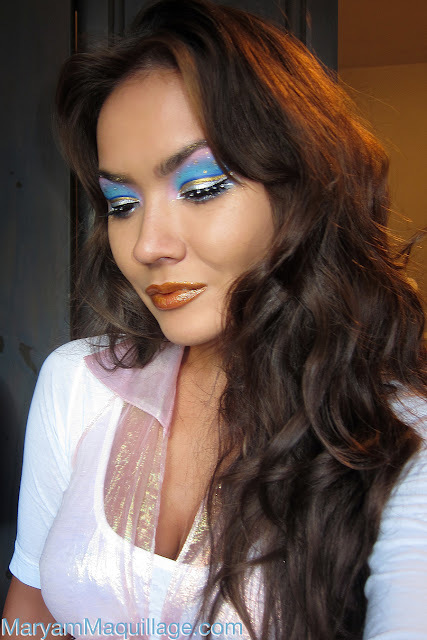 Stack the liquid liners on the movable lid starting with the bright blue on the crease, then the metallics (any order) and finish with the black to give your eye some definition. Optional: Add stars, shooting stars and dots to create your twilight sky. Create a gilded brow but swiping a few gold and silver strokes in the direction of hair growth. Finish the look with funky false lashes. 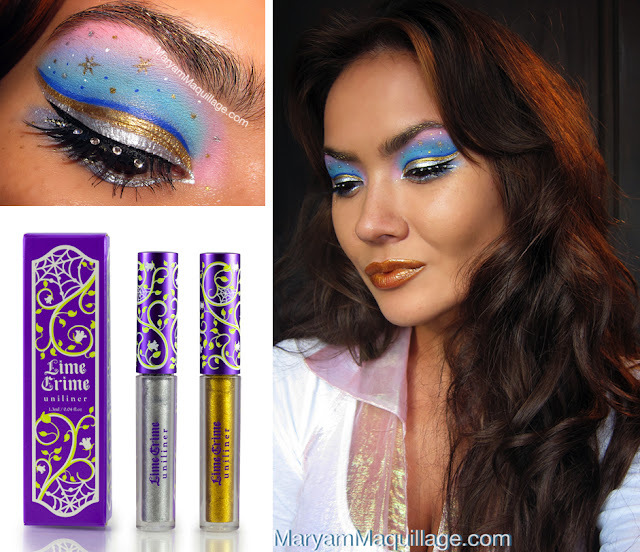 To complete this White Nights-inspired eye look, I added star studded rhinestone half lashes. These half lashes are playful, flirty, and complementary to any dramatic eye look. I love the flared spikiness at the outer corners -- the reflection works seamlessly with my drawn-on lash extensions. 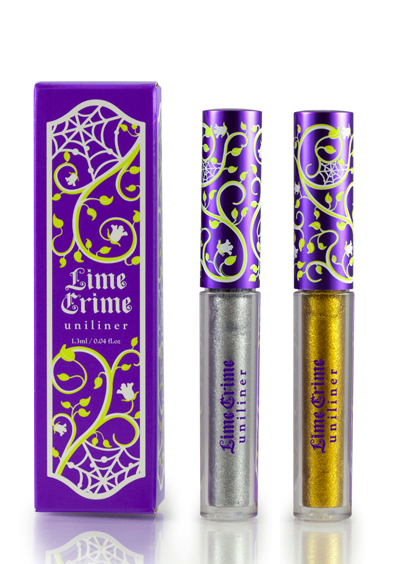 What will Lime Crime come up with next?! Who's ready for the Alchemy collection? *The product/s in this post were sent by said company for my use and consideration. thanks lovely :)) you can do this, it's quite easy!! Oh Maryam you gorgeous gal! I love this! Its so enchanting looking! aww thank you so much beautiful!! So cute! Beautifully done. 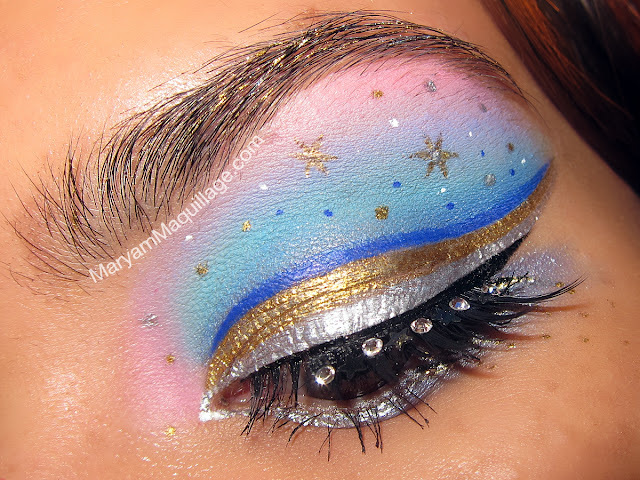 Love the beautiful colors of eyeshadow in the background & the cute little stars! the essence of beauty wow you're an artist!!! Wow! You are truly talented. This is such a detailed and beautiful look!! Oh my god, I simply looove your looks!! You always look so great...<3 I love these color, I really fell in love with this! Wow that looks so amazing!! You are so talented!! so perfect and gorgeous honey,i looooove it! so nice eyes so lovely . wow! incredible! you look like a goddess! Wow...you're like a princess! xo! I'm so flattered that you'd put me in the same category :)) Thank you darling!! Ai un blog interesant! Te astept pe la mine http://filmandotherstories.blogspot.se/. Wow, Maryam, how exotic and magical!! Okay you must have ALOT of patience, looks amazing! Holy crap that's amazing. I've been wanting to try the uniliners, but maybe I'll wait until these release, they're gorgeous! these are absolutely wonderful, I am obsessed with the colors!! they should be out by thanksgiving :))) thanks hon!! Stunning & sensational Maryam. You are definitely from an alien planet - so beautiful and charming. Gorgeous! I love the pink and blue shadows together, it reminds me of an early morning sunrise. I totally want to visit St. Petersburg! 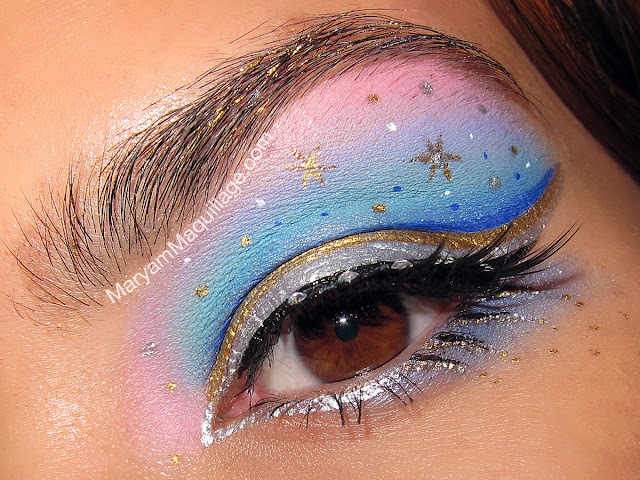 Great job Maryam... You are one talented girl and those liners look fab! I absolutely adore you colorful creative looks! Really like how the gold and silver stands out! Again, this looks amazinggggg! You always know how to amaze us with your creativity and your wonderful makeup looks!!! You are such a damn good artist with make-up!! I love your looks, you really think out of the box and that's admirable! I'm rarely ever interested in eyeshadow posts because they all look the same or are really badly done, BUT I am totally, totally in love with this! I love the stars and the combo of those colors. Looks beautiful.